Looking for a delicious alternative to your same old chicken sandwich? 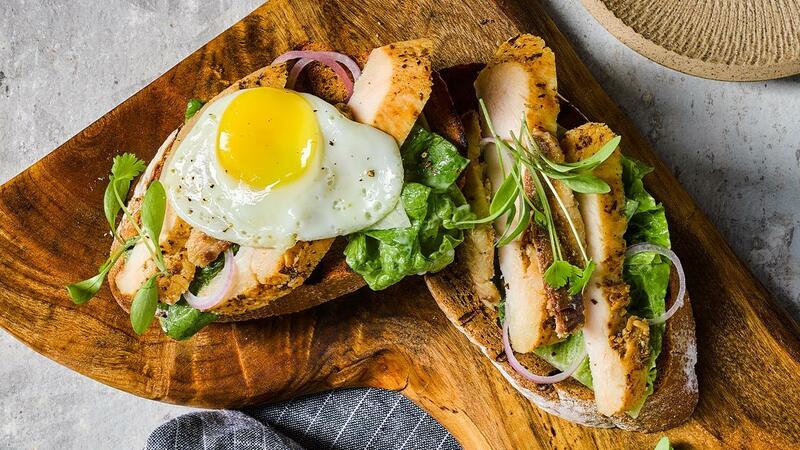 This chicken sandwich packs a delightful touch of herbs that promises to keep your day going. Marinate chicken breast with Pesto Herb Paste and oil for 2hrs. Pan sear chicken breast till golden brown on each side. Finish off in a preheated oven at 180°C for 8mins. After which, remove from oven and rest chicken before slicing. Prep salad accordingly, grill the rye bread on both sides. Pan fry quail eggs and sliced sardines, rinse romaine lettuce. Place sandwich filling onto grilled rye bread, add on pesto chicken slices. Drizzle Caesar Dressing over filling and garnish with mustard cress and red onion slices.